We offer a range of plumbing and heating services to keep your home or business working efficiently. 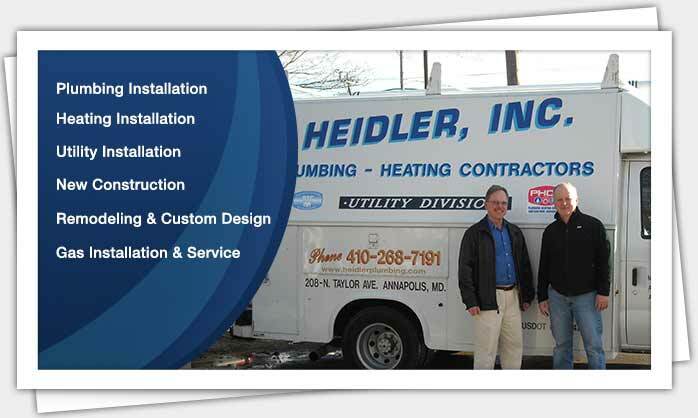 To work with your local Annapolis plumber and heating contractor, give us a call today at (410) 268-7191. You will receive the expert care you deserve. Click here to view current specials and discounts. Need a plumbing and heating company that can solve your specific problems? Heidler, Inc. is here to serve you and help you get your home or business back to normal. We will be there when you need us the most, no matter what time it is—you can count on us 24/7. Click here to visit our reviews page. Read on to see what some of our customers have been saying. We always make sure our clients receive the best care possible. This includes fast service, so you don’t have to wait to have your problem taken care of. First impressions are important, and we want to provide quality care from the beginning. Our experts can get to the bottom of any problem and make sure your plumbing and heating systems return to normal in no time. Loyal customers rely on our quality services for all of their plumbing and heating needs. After experiencing comprehensive care and long term solutions, they continue to trust us as the experts. Our greatest priority is making sure we have solved each of our customers’ problems, so you can enjoy greater comfort and safety. Call us today at (410) 268-7191 and learn why your neighbors in Annapolis are saying they will never call another company for their plumbing or heating project. You will always receive upfront, flat rates with every service.